There were 664 press releases posted in the last 24 hours and 153,496 in the last 365 days. United Scientific Group (USG) received the YTEXAS RēLO Award for being recognized as one of the top 50 most relevant corporate relocation's into Texas State. 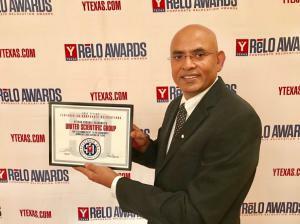 PLANO, TEXAS, UNITED STATES, October 27, 2017 /EINPresswire.com/ -- United Scientific Group (USG) received the YTEXAS RēLO Award on September 29, 2017 for being recognized as one of the top 50 most relevant corporate relocations into Texas State over the previous 5 years. The award is given annually to the exclusive list of companies who have relocated their corporate headquarters to Texas. The awards and featured 50 companies are voted upon by a select group of seasoned Texas CEOs. “We are pleased to recognize United Scientific Group with our #25 ranking this year. United Scientific Group made a commitment to moving to Plano, Texas and is now a powerful influencer in STEM education and research in our state”, said Ed Curtis, CEO of YTEXAS. YTEXAS is an organization that accelerates CEO connectivity and corporate presence for companies that are newly relocated to Texas. The award ceremony helped us have personal introductions with the other innovative minds. 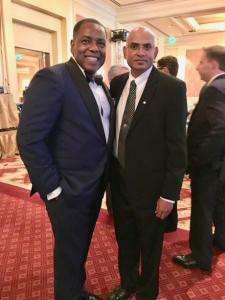 NTT Data, Hilti and the Mayor of Plano, Mr. Harry A. LaRosiliere also attended the event from Plano TX along with the Associate Vice President of USG, Dr. Sudhakar Yakkanti. The headquarters of USG was shifted to Plano, TX in November 2016. The move was necessitated by the growth, the company has realized in the last few years. The centralized location of Dallas, TX would make the travel distance shorter and would be time saving for the team members who need to travel all around the United States of America (USA) to organize scientific conferences and workshops. The facility at Plano TX (DFW metro area) offers more efficient layout, supports our continuing growth and expansion with a better work environment for our staff. About the company: United Scientific Group (USG), an expert-driven initiative led by the editor’s association and the advisory board which includes academicians, researchers, and industry leaders across various fields of research. USG provides broad range of services in the fields of science and technology including publishing, conducting world class scientific events, and holding highly interactive and proficient world forums.